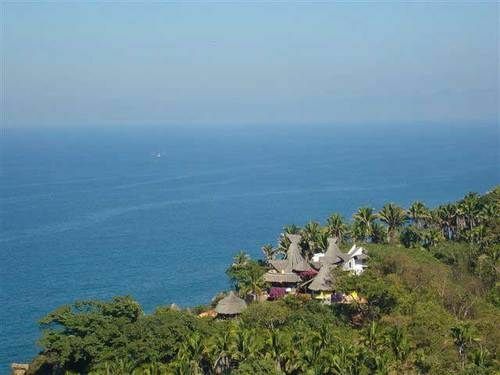 Eingebettet in den Dschungel an der mexikanischen Pazifikküste, nahe der modernen Zivilisation von Puerto Vallarta liegt Villa Clavellinas. Die Liegenschaft befindet sich innerhalb eines 25 Acre privaten Naturschutzgebiet 4 km nördlich von der charmanten Stadt San Pancho und nur 45 Minuten vom internationalen Flughafen Puerto Vallarta entfernt. Schneiden Sie aus dem Dschungel auf einer Klippe über einer Felsenklippe, genießt Villa Clavellinas Panoramablick auf den Pazifik und die frische Meeresbrise. Eine herrliche Zwei-Ebenen-Infinity-Pool mit einem Wasserfall verbunden sitzt auf dem Rand der Klippe ein idealer Ort, bietet Schulen von Walen und Delfinen sowie Schwärme von Pelikanen, Sturmvögel, Adler und Fregattvögel zu beobachten. Villa Clavellinas hat direkte Treppe Zugang zu einem privaten weißen Sandstrand mit nur zwei anderen Villen geteilt. Dort können Sie sich ausruhen, schwimmen, schnorcheln, Kajak fahren, angeln, Frisbeegolf spielen, wandern und generell abhängen. Diese exklusive Villa von rustikalen mexikanischen Architektur umfasst eine spektakuläre 65 Fuß Palapa von Hand Königspalmwedel gewebt Open-Air-Wohnraum anbieten und mehrere Wohn- und Essbereiche. Rote Terrakotta Ton Fliesenböden im ganzen Haus werden von bunten glasierten mexikanischen Fliesen akzentuiert. Das Haupthaus verfügt über drei Schlafzimmer, jedes mit eigenem Bad mit Dusche im Freien in der mexikanischen Fliesen und Terrassen mit Meer und Blick auf den Dschungel. Zwei charmante Casitas mit privaten Bädern, Sitzbereichen und Terrassen machen Villa Clavellinas ideal für größere Gruppen von bis zu 40 Personen. Im Lieferumfang der Villa ist tägliche Reinigung (außer Sonntag) und andere Vor-Ort-Service kann arrangiert werden, einschließlich Koch, Lebensmittel einkaufen und Wellnessanwendungen. Wir bieten Küchenchef Service und ausgezeichnete Restaurants der Stadt. Die große Terrasse ist mit einem 4 M Esstisch während der Mittagssonne bis 14 unter den Sternen oder beweglichen Schatten Tuch mit Platz für bis ausgestattet. Aktivitäten in der Umgebung können auch wie Bootfahren angeordnet sein, Angeln, Reiten, Surfen, Tauchen, Dschungel-Abenteuer, und vieles mehr. Wir bieten einen Chefkoch und besorgen Speisen und Getränke für die Gäste. Zwei Mahlzeiten pro Tag sind enthalten, zuzüglich Lebensmittelkosten. We spent Dec 21-28, 2018, at Villa Clavellinas, celebrating Christmas and our 50th wedding anniversary. Our party included my wife and I, our 4 adult children, and our 4 granddaughters, ages 8-11. In the planning phase of our trip, we spoke several times with the villa's owner, Howard Fields. He was very helpful answering our questions and making suggestions regarding our plans. The villa is open and spacious, built into a jungle hillside, surrounded by tropical foliage, with views beyond spectacular. It looks out over the Pacific Ocean, where whales and dolphins were a common sight. On our arrival, our granddaughters were delighted to discover a giant white unicorn with rainbow tail floating in the pool. They enjoyed hours of watery fun playing on its back. We opted for a chef to prepare our meals. The food and beverages were plentiful, beautifully presented, and absolutely delicious. The property manager, Manuel, checked in on us regularly to handle our questions and special requests. The daily housekeeper was efficient and thorough. All the staff were friendly, cheerful, and accommodating. The beach is a bit of a hike down a steep slope on a beautiful paved trail. It's a good way to burn off the calories from the pollo poblano, chilaquiles, and Margaritas. The beach itself is a private paradise, a wide expanse of pure sand washed by warm, sparkling surf. We took advantage of all the beach toys, including kayaks. Life jackets in all sizes are provided. Trips to the charming town of San Pancho provided diversion. For transportation, including airport pick-up and drop-off, we used the local taxi service, which has vans available for groups our size and larger. It was easier for us than renting cars. We thoroughly enjoyed our week at Villa Clavellinas, a truly memorable experience! Thank you, Howard, for sharing your beautiful villa with us. Not only is the property in one of the most beautiful locations, the staff is amazing!! Our three generation family was well cared for. The food was incredible. Everything was kept clean and orderly. The view from the pool took my breath away. Would give ZERO stars if I could. We reserved this home in April 2016 for a 7 night stay in December over Christmas. Since this was for Christimas, we were paying a premium for the home and made a 50% deposit to reserve the home - we had 11 people coming from Canada and US. We contacted Howard (owner) several times in the following months to confirm final payment, logistics, and home amenities so that we could prepare for our visit. We even confirmed with him that we were reserved because we noticed that the VRBO calendar showed the dates as available. Each time, Howard was extremely slow to respond and we had to follow-up multiple times; his responses were often short, vague or incomplete. Then in December, one week prior to our arrival (when we were arranging with the house staff for our airport pick-up), we received an email from Howard saying that he double booked the home and that we could no longer stay (even though we reserved first). He made a superficial attempt to find another home for us and after a few days of being stringed along and poor communication from him, we asked for a refund (with interest). After another several days of more follow-up (and lots of excuses), he finally paid us (but without interest). We suspect that another group came and offered more money - otherwise, Howard's reasons for not giving us the reservation made absolutely no sense since we had reserved the home first. I'm posting this review to make others aware that the owner is disorganized and does not communicate well - I wish we had known of the risks before we booked. And just as an FYI, VRBO does not provide any coverage to guests in situations like this (0 stars for them too). I can't really add too much more to what has already been written. We had an unbelievably relaxing vacation staying at Villa Clavellinas. Our extended family group ranged in age from 22 to 90. My mother-in-law was the eldest and had no problems scampering up and down the stairway from the house to the beach. During our stay we surfed, fished, kayaked, hiked, ran, and went sightseeing. There was also plenty of time to relax on the premises to read, write, and look over the ocean. We hired cooks for our entire visit and feasted like royalty. The food was incredible from shrimp rellenos, chicken enchiladas, huevos rancheros, fresh salsas, mariscos, margaritas, guacamole, and chips. The cocineras were fun and a pleasure to be with. San Pancho is roughly 30 minutes away, Sayulita perhaps an additional 10 minutes. It was nice to head into town periodically to shop and experience the culture but it was nice driving back through the jungle to have the seclusion of the Villa. As I mentioned before, our stay was very relaxing. I slept like a rock, lulled to sleep every evening by crashing waves. I would return to Villa Clavellinas in a heartbeat. Our extended family was looking for a place in Mexico near Sayulita for a week between Christmas and New Years. There are 12 of us ranging from 24 to 90 years old (my 90 year old mother is very youthful and always up for something new) We came upon Villa Clavellinas on VRBO and decided to give it a go. We couldn't have been happier and were so glad to be away from the crowds in Sayulita. The Villa is more incredible even than it looks in pictures (I know that doesn't seem possible, given the photos, but this place is amazing) There are private balconies off of every bedroom with views to the jungle and the ocean. There is a huge patio with an ocean view for dining alfresco or plenty of room to sit at a table inside if preferred, also with ocean views. We decided to have our meals cooked for us and enjoyed not only eating really well, but practicing our spanish and learning by watching how to cook some local dishes. There is an infinity pool right on the cliff overlooking the ocean and two lovely beaches one just down the steps of the villa and one a short hike through the jungle. We swam, kayaked, hiked, surfed, shopped in San Pancho and Sayulita, enjoyed eating and reading and just hanging out together. It was a great place for our group as there were generous communal areas, and also little hideaways for down time. I would highly recommend Villa Calvallinas and speaking for our whole group can't wait to go back! A close group of 9 of my dear friends had the pleasure of experiencing Villa Clavellinas in March of 2015. We made the trip to celebrate a beautiful lady's 40th birthday. It was the trip of a lifetime. We all are making plans to return. It is the perfect place for a large group. The views are incredible. Very private and relaxing. Plenty of room for several guests. I highly recommend requesting the service for meal preparation. We had the immense pleasure of having a wonderful cook prepare us one meal daily and it was worth it!! Incredible addition to the whole experience!! The only obstacle would be for someone with any physical handicaps or small children-any under 10. The stairs are many and steep and the property is not for small children. Also, rent a 4-wheel drive vehicle for the jungle road from the villa. It is not for small vehicles. Other than that, prepare yourself for pure magic and sweetness. This a gem in the jungle!! Rates shown are for the Villa only. Casitas are an additional $55 per night per casita during standard and high seasons and an additional $75 per night per casita during holidays. There is a premium applied to the high season rate for Thanksgiving, Christmas, New Years and Easter holidays.